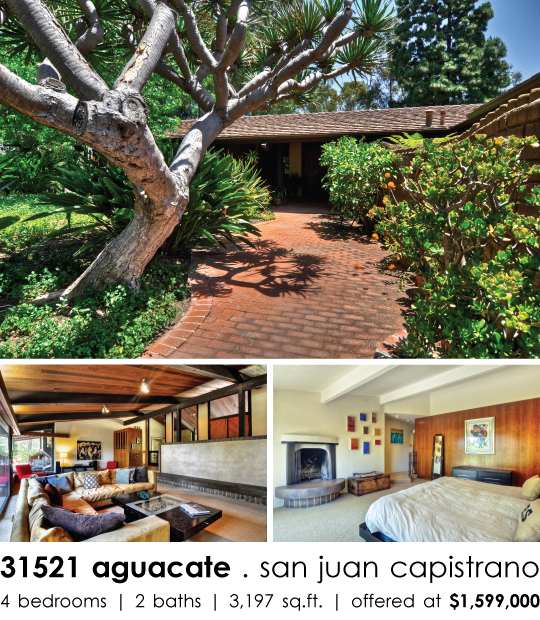 Designed by architect Marvin W. Renfro in 1965, this custom single-family residence is located in one of San Juan Capistrano’s most coveted residential enclaves. The residence exemplifies classic Early California architecture at its finest, with vaulted ceilings, exposed beams, generous overhangs, and large picture windows. A beautiful palette of terra cotta tile, brick, and wood creates a warm and inviting environment throughout this 4 bedroom, 2 bath home. Floor to ceiling windows in the living room create a seamless visual connection to the outside. A private master suite, separate from other bedrooms, features a charming wood burning fireplace, large walk in closet, and separate dressing room. Enjoy indoor-outdoor living with patios off of every room and views of San Juan Valley and surrounding hillsides. The property’s expansive lot provides ample space to create a dream outdoor oasis. Equestrian and nature enthusiast will enjoy direct access to Peppertree Bend Trail. Conveniently located near Mission San Juan Capistrano and some of Southern California’s best beaches.